Microsoft has just released the first public preview of their new Windows 8.1 operating system for x86 32-bit/64-bit machines, desktops, notebooks, and tablets. The preview can be downloaded here. A example search for "marilyn monroe"
Windows 8.1 has added server low-level optimizations, bringing refinements to the Modern UI (formerly Metro UI). This starts with deeper integration of Bing and SkyDrive, which may not appeal to everyone. Bing consolidates local and web results into a collage of relevant information related to your search terms. The improved integration of SkyDrive with the filesystem, specifically files and settings, allow you to access both your documents and settings across multiple devices. It appears that Microsoft has listened to their customers and has re-introduced features that were missing from Windows 8. Windows 8.1 allows you to set your device to boot either into the Start screen or the traditional Desktop. There have been no changes to the desktop font but the Windows button that was missing before has been returned to its home. The Start button is not what most people thought it was though. Clicking it doesn't bring you to the Start Menu people are accustomed to, instead it brings you to the Modern UI Start screen, which was a disappointment. Essentially they moved the start button that was in the charms menu, and placed it in the traditional Start Button position. All your frequently used apps and documents are in that screen, so it takes about the same time to choose what you want compared to a "real" Start Menu. The animations may add some time though. One thing I do like about the new Start Menu is that it provides more information such as weather and has your undivided attention. The menu takes up the entire screen instead of a tiny corner of the screen, allowing for fewer distractions (albeit introducing others, thanks to Modern UI) and has a lot more area to show more apps and files, especially if you have multiple monitors since the Modern UI will stretch to fill all monitors. The modern Start screen has had a few improvements as well. There are new backgrounds for the menu called "Motion Accents", which are static objects that animate as you scroll or swipe across the screen, similarly to the new iOS wallpapers that move with the phone and the panoramic Android wallpapers. The wallpaper also doesn't distract you when it is not moving, unlike Androids Live Wallpapers which are cool for the first 5 minutes then get annoying. The Start Screen also introduced two new tile sizes, large (twice as large as medium) and tiny (a quarter of a regular one). Large tiles are great for apps that can display a lot of information such as weather and stocks. While the tiny icons can be used for your programs or shortcuts. A great example that was shown in the video for Windows 8.1 would be grouping four Microsoft Office tiles in the same space as one normal tile. Windows 8.1 improves multitasking in the Modern UI apps. It now allows you to put as many apps as you want side by side, provided that you have enough screen real estate. Microsoft says that each window should get a minimum of 500 horizontal pixels at default font resolution settings. A standard 1080P monitor should be able to fit 2 or 3 side-by-side windows. The new Internet Explorer 11 is built into Windows 8.1. When in desktop mode, Internet Explorer isn't very different from the previous version. The difference is when it is in Modern UI mode., it introduces new features such as Reading Lists and allows you to make a chronologically sorted list of temporary bookmarks. This allows you to go through many news sites, drag articles you think were interesting, and read them without worrying where you found it from. There are new features in the Camera and Photos apps. A new panorama mode has been introduced, but is not available on the desktop version, for obvious reasons. The panoramic mode is the same as other mobile operation systems such as iOS and Android. Simply pan your device from left to right (or up and down) and the software takes care of the rest. The photos app introduces a feature called Basic Fixes, which allows basic photo editing such as rotate, crop, levels, tones, etc. Many veterans of the internet know that self-diagnosing illnesses/sicknesses on the internet almost always results in you having some form of cancer. Microsoft still believes that many people still want to self-diagnose symptoms and has put that into their new Health and Fitness app. The app allows users to enter symptoms into the app and Bing will search the web for solutions. Patients often assume the worst and attempt to do self-mediation, resulting in possible life threatening results. Personally, I believe that the Symptom Checker is a terrible idea as some people may blindly trust the software seeing that it was released by Microsoft. 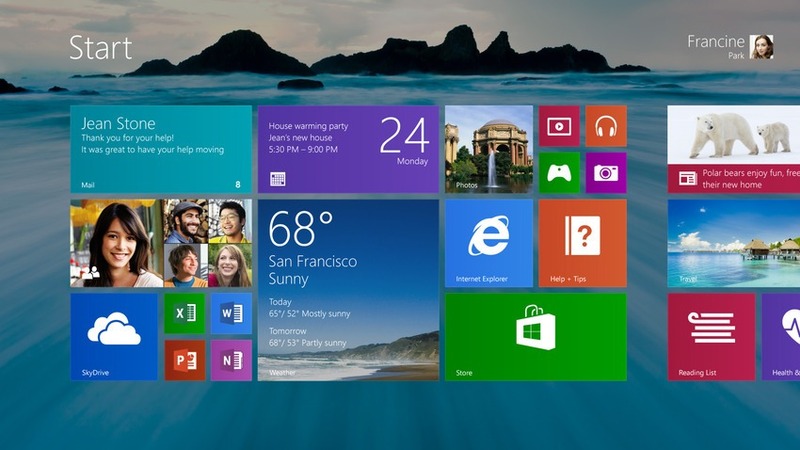 Windows 8.1 Preview irreversibly upgrades an existing Windows 7 or Windows 8 installation. The disc image that lets you clean-install the software is not available yet. When the Preview key expires, Windows 7 users would have the option of purchasing Windows 8.1, after which an RTM (release to market) version of the operating system will be downloaded and installed over the Preview (to keep your files, programs, and settings); while users coming from Windows 8 will get that RTM installation of Windows 8.1 for free.